Living in Northwest Ohio and Southeast Michigan we experience all four seasons, including freezing cold winters. When the mercury drops in Toledo, it can get down well past zero, add wind chill factors and you can even get the attention of the Eskimos. Every year it comes, and yet every year many people are caught off guard and suffer the consequences. Be Prepared! Ready your Home or Business for those freezing temperatures well before they come. 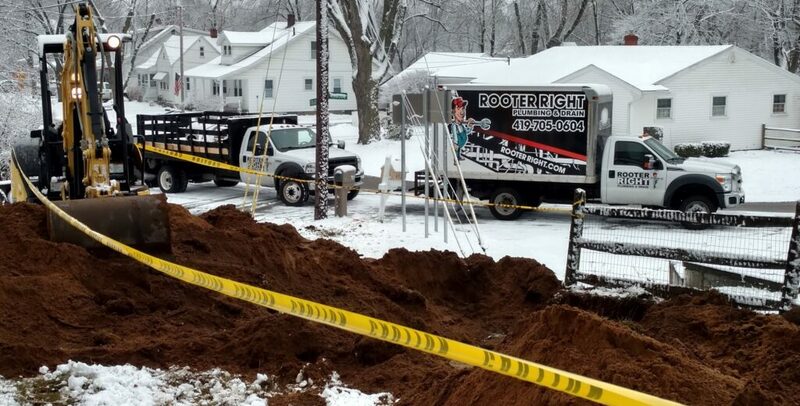 Rooter Right can help all year round, and if you’re one of those caught unprepared, we can help you too. 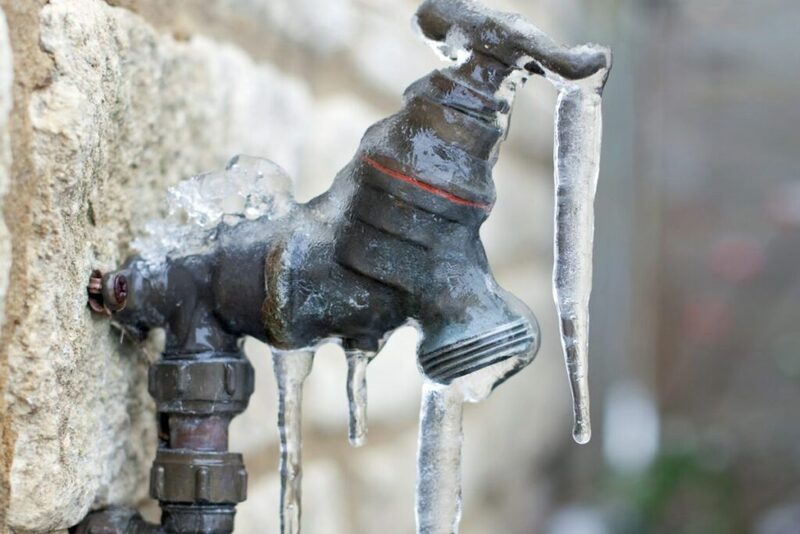 There are only a few things more dangerous to your home or business than Frozen Waterlines. Not only will you experience the inconvenience of not having water, but you also face the danger of having your water lines burst. It is crucial that as soon as you notice that your Water Lines are Frozen, you have them thawed. Leaving them to thaw on their own puts you at great risk for breakage. Ice Expands in the pipe creating pressure, because the ice takes up more volume in the pipe then it would in a liquid state, the pipe will literally split under the pressure. Once the pipe splits, it’s like turning on a garden hose, the water sprays everywhere and will continue to spray until the main is shut off. These splits in the pipe can happen in multiple locations at one time, causing water damage throughout the structure. The interior of a house or commercial building can be destroyed in very little time. Frozen Drain lines can be very inconvenient as well, but they usually aren’t as destructive as Frozen Water Lines. The Drain Lines however, are much more complicated to thaw compared to waterlines. The pros at Rooter Right have mastered a few tricks over the years to simplify this process. The key is to deliver hot water under pressure directly to the frozen area; this is something that is usually easier said than done. No matter how complex the problem may be, we can always find a solution. Rooter Right has a number of techniques for Thawing Frozen Water and Drain Lines. Over the years we have seen just about every frozen scenario you could think of, and we have conquered each one. Our state of the art equipment and years of experience put us in a position to handle any freeze with ease. The BEST way to handle Freezing Lines is to properly prepare for those cold temperature well before they arrive and prevent freezing all together. Mobile homes are especially susceptible to freezing temperatures, it is important to always make sure the skirting on your mobile home is intact. Applying heat tape and insulation is a great way to prevent freezing water lines in a mobile home and any place where Waterlines are exposed to cold temperatures. Rooter Right Plumbing & Drain offers this service year round and we recommend you do it well before the cold season. If your house is on a crawlspace it is important to be sure to close the air vents in the crawl during fall and winter, this helps keep cold wind from blowing on your pipes. Again, this is another area where heat tape and insulation will go a long way in preventing your pipes from freezing. Wind combined with cold temperatures will accelerate the freezing process. It is important to identify and seal any air gaps in your home that will allow wind to pass through. Another thing to avoid is installing Water and Drain Lines in the exterior walls of your building. The exterior walls are far more susceptible to cold air and wind, which puts your pipes at risk. Never run Water Lines through an attic space unless it is heated, or you install heat tape and insulation on the pipes. Attics are rarely heated and the temperature in your attic, in winter, is usually just as cold as the temperature outside. If a Water Line should happen to Burst in your attic, it would be quite similar to rain clouds inside your house. If you have had a Frozen Line in the past and haven’t made any changes in that area to combat the cold, you are likely to experience that freeze again. We can help, call Rooter Right before the cold season for a Consultation and let us identify areas where you may be at risk for Freezing. Address these areas before winter comes and you can sleep sound knowing that you’re well prepared. When the cold temperatures arrive there are a few simple things you can do to help prevent your lines from freezing. First, open the cabinet doors under your sinks. Doing so, this will allow the warm air in your home to mix with the often colder air in the cabinet. This is especially important for Kitchen Sinks because often times, the Kitchen Sink is on an exterior wall. Let your faucets run a small thin stream of water. It’s important that you turn on both the hot and the cold when you do this. Moving water is much harder to freeze than still water. Open the doors of rooms in your house that generally stay colder. Instead of trapping the cold air, allow that cold air to mix with the air of the warmer rooms. If you have a utility area with exposed Pipes that stays colder than the rest of your home or business, add a space heater to that room. The little increase in the electric bill is far less costly than potential damage from Frozen Lines. Always disconnect your garden hose from the spigot before the cold comes. Forgetting to do so can quickly lead to the breaking of the spigot, this is one of the most common ways to experience a Burst Pipe. 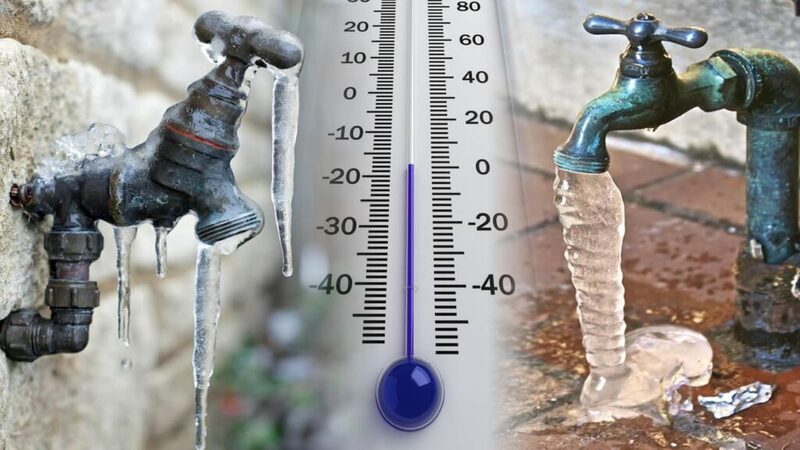 The bottom line is Freezing Temperatures and Pipes don’t mix. If you know of any area that contains Plumbing Lines and gets extremely cold, find a way to introduce heat.